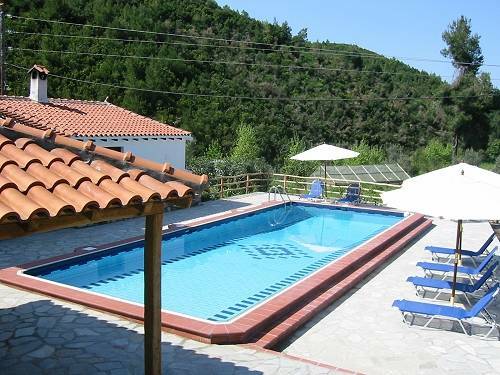 Zorbathes is a peaceful valley which is hidden close to the centre of Skiathos Island. 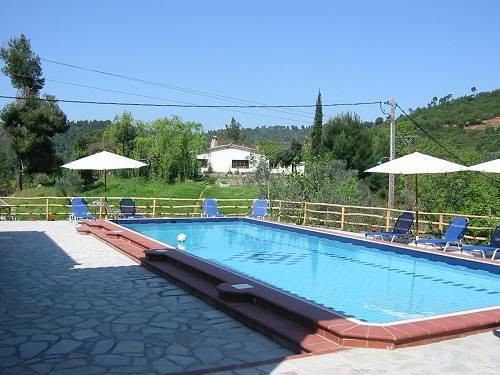 It is green & fertile & surrounded by pine forests. Through the bottom of the valley run stream beds whose banks are covered by an abundance of wild flowers & ferns, & are shaded by massive plane trees. This end of the island, which is closest to the Pelion Peninsular, receives a goodly amount of winter rain & the lushness of the valley & the surrounding pine forests reflect this. This is a place to truly relax in. We have added a good size swimming pool for 2004. The Farmhouse is recently built but in traditional style using rock, wood & stucco, natural slate & tiles. Internally we have laid floors of wood & terra-cotta tiles. The cupboards & kitchen furniture are all hand made in pinewood. 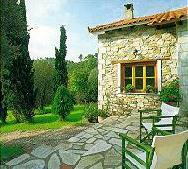 Outside is a large shady patio of Pelion slate, with a barbecue, & a lawn with shade from cypress, olive & fig trees. Creeping up the walls are bougainvillea, jasmine, honey-suckle & oleanders. The patio is surrounded by pot-plants & flowering shrubs. The accommodation consists of a large, fully equipped kitchen, with steps leading down to "The Snug" where the fireplace is situated. There is a bathroom with bath & shower, & a smaller toilet with hand-basin upstairs. Downstairs there are 2 double bedrooms & upstairs is another double bedroom plus a small, 1 person, sleeping "loft" (ideal for a child). There is ample room for 1 bed to be added should it be necessary for a large family or group. We built this house for when one of our daughters gets married & Lida has made it into a "home" rather than a "rental". All our clients have commented on it's cosy feeling. Unless you are keen walkers, car hire is recommended. We work together with several hire car firms and can arrange your hire car for you. Nearest supermarket: 35 minutes walk. Nearest evening taverna: 25 minutes walk. Skiathos Town: 20 minutes drive. Skiathos Airport: 25 minutes drive. Please use our Booking Form to make your reservation.